A little under 3,000 years ago someone in Ireland was very, very rich. In March 1854 a ganger ordered some navvies working on the construction of the West Clare Railway near Newmarket-on-Fergus to straighten a dyke running close to the small lake of Mooghaun. They shifted a stone and found a small, rough chamber with a flagstone on top. When they opened it they uncovered one of the largest hoards of Bronze Age gold objects ever found in western or northern Europe. The navvies filled their pockets and ‘disposed each of his share to travelling dealers’. 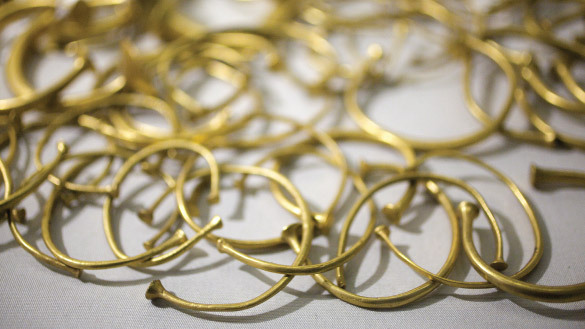 Many pieces were melted down, but the evidence suggests there were 138 bracelets, six collars, possibly two torcs and four other pieces: 150 objects, all of gold. The 29 objects that survive, split between the National Museum of Ireland in Dublin and the British Museum, in London, are not especially remarkable in themselves. The gold collars are distinctive but not as well worked as many others from this period. Most of the hoard consists of relatively simple bracelets, whose more or less uniform design has prompted suggestions that they may have been merely a way of storing the gold. What is extraordinary is the sheer scale of the wealth they represent. Mooghaun had a large and prominent hill fort, with three huge, roughly concentric stone ramparts enclosing about 12 hectares and commanding wide views of the Shannon estuary. The fort may have been a ritual centre serving as the capital of the wider region. Pollen analysis from Mooghaun lake shows that the area was intensively farmed at the time. The wealth of the hoard suggests, however, that the Shannon estuary was also being used for fishing and trading. There must have been a long period of stability and prosperity in which such riches could be accumulated. Were the Dowris, Mooghaun and other hoards buried as votive offerings to the gods, or merely for safe keeping? The Mooghaun hoard’s siting near a lake might point to the former, but the stone chamber in which it was buried suggests that the gold was meant to be accessible to its owners. Hoards such as these tell a story of human motives that were probably a blend of protection of material wealth, preservation of memory and propitiation of supernatural powers. Either way, the Mooghaun hoard tells us of an Ireland characterised, in the words of archaeologists Andrew Halpin and Conor Newman, as ‘one of old wealth, stability and cultural homogeneity’. In a literal sense, at least, this was a golden age. Like all such ages, it was not to last.